This angle of the Old City Hall arched entrance shows a small section of its beautifully detailed columns. The entrance looks on to the tall modern building. The modern architecture is simplistic in its details. 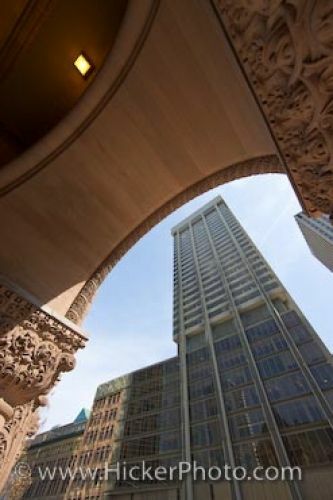 The old world architecture and the simple modern building details sit closely together in downtown Toronto. Looking out through the entrance of the Old City hall to the surrounding modern buildings in downtown Toronto, Ontario, Canada.